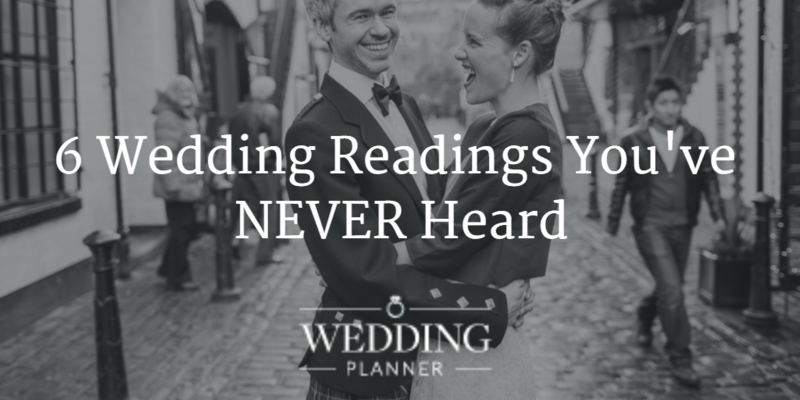 Fed up of hearing the same wedding readings time and time again? Yup, so are we! That's why we've searched far and wide (and read many, many books, of course!) to discover the unsung heroes of wedding readings and bring them to you on the Wedding Planner blog! Between a man and his wife, nothing ought to rule but love. As love ought to bring them together, so it is the best way to keep them well together. A husband and wife that love one another show their children that they should do so too. Others visibly lose their authority in their families by the contempt of one another, and teach their children to be unnatural by their own examples. May you enter into the mystery which is the awareness of one another's presence no more physical than spiritual, warm and near when you are side by side, and warm and near when you are in separate rooms or even distant cities. Love feels no burden, takes no account of toil, attempts things beyond its strength. Love, trust, and forgiveness are the foundations of marriage. In marriage, many days will bring happiness, while other days may be sad. But together, two hearts can overcome everything...In marriage, all of the moments won't be exciting or romantic, and sometimes worries and anxiety will be overwhelming. But together, two hearts that accept will find comfort together. Recollections of past joys, pains, and shared feelings will be the glue that holds everything together during even the worst and most insecure moments. Reaching out to each other as a friend, and becoming the confidant and companion that the other one needs, is the true magic and beauty of any two people together. It's inspiring in each other a dream or a feeling, and having faith in each other and not giving up... even when all the odds say to quit. It's allowing each other to be vulnerable, to be himself or herself, even when the opinions or thoughts aren't in total agreement or exactly what you'd like them to be. It's getting involved and showing interest in each other, really listening and being available, the way any best friend should be. Exactly three things need to be remembered in a marriage if it is to be a mutual bond of sharing, caring, and loving throughout life: love, trust, and forgiveness.